Ferret Nation cages from Midwest are quite simply the best ferret cages on the market, loved and adored by ferrets and owners alike. Instead of taking a generic, one-size-fits-all approach when it comes to cage design for small animals, Midwest worked with ferret owners to design and build a dream cage made specifically for ferrets. An amazing amount of play space and room for hammocks and toys. Durable plastic trays that slide in and out for easy cleaning. Locking double doors with solid ferret-proof latching mechanisms. Attached casters so that Ferret Nation cages can be easily moved. Adjustable levels and integrated ramps. 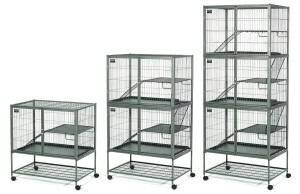 What really sets the Ferret Nation line of cages apart from the competition is durability and ease of cleaning. Ferret owners know very well what a headache it can be to clean traditional cages, but the Ferret Nation cages are a snap to clean. The latching double doors swing open for easy access to every nook and cranny, and the solid plastic trays slide out for easy cleaning. Assembly of the Ferret Nation cage is very simple and straightforward, and the locking design is incredibly sturdy. Each steel part is powder coated and with a hammertone finish that’s impervious to urine and will never rust. 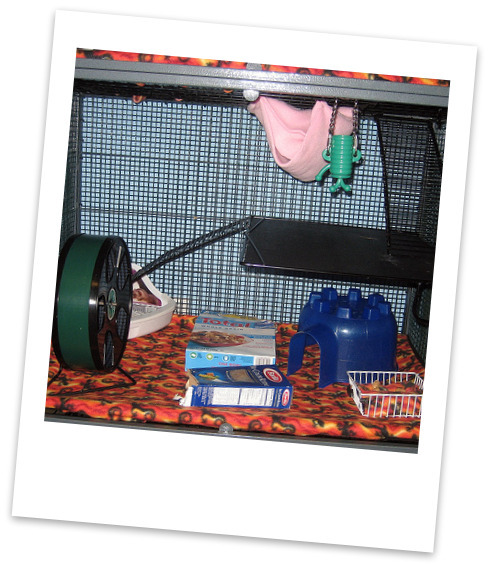 The integrated shelf on the bottom is a great place to store extra food, toys, and bedding, and the attached casters allow you to easily move Ferret Nation cages from room to room, so that you’re never far from your favorite ferrets. Some pet stores now sell Ferret Nation cages but the best prices by far are usually found online, with Wayfair and Amazon the best places to buy your ferrets their amazing new home. MidWest also makes the Ferret Nation 183, which is an add-cage that sits on top of the Ferret Nation 181 and Ferret Nation 182 models. MidWest also now makes and sells a Ferret Nation cage accessories kit that comes with durable fleece covers for all pans, shelves, and ramps. 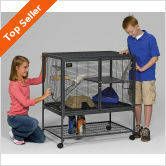 When shopping for an add-on unit, be sure that you have a compatible Ferret Nation cage model. The add-on cage is new and will only work with the newer FN 181 and FN 182 models. It won’t fit and lock into earlier Ferret Nation cages such as the FN 141 and FN 142. 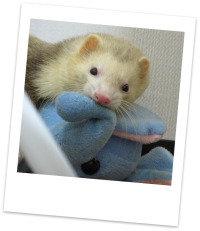 The accessory kit, however, will fit and work with all Ferret Nations even the older models. 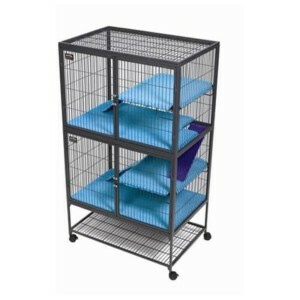 Ferret owners around the world love the Ferret Nation line of cages, as they offer ample room, can be configured in many different ways, and consistently get the best reviews at ferret sites as well as at online retailers. FREE shipping - Click now! "Our three boys love their Ferret Nation Double, and I'm so glad I bought it. It seems expensive at first but they love all the extra space, there's tons of room for toys and hammocks, and I don't dread cleaning it like I used to." - Ellen B.